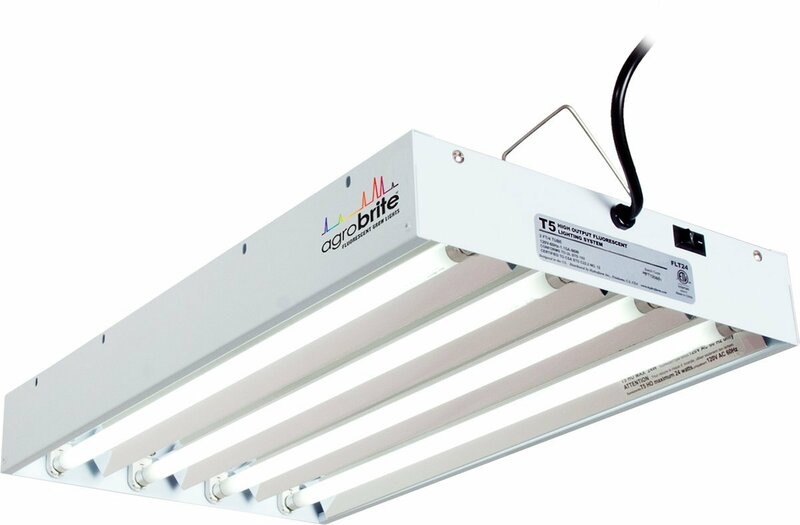 The manufacturer of this Agrobrite fixture is one of the biggest and most popular hydroponic equipment manufacturers in the U.S. and the world – Hydrofarm. They own multiple famous lighting brands like EnviroGro, Quantum, Jump Start, Phantom and AgroBrite that are used by thousands of people, and they have proved the greatness of their company with the quality of their products and their customer service, operating almost 40 years now and evolving with each new year. The fixture we are talking about in this review is Hydrofarm’s AgroBrite 2 feet 4 tube fixture. Like you can guess this lamp is from the AgroBrite line that features fixtures with high lumen output, but low watt consumption so you can have a lamp that offers high performance and flexibility regarding as to what for you use it. This particular size fixture will give out up to 8,000 lumens but will consume only 96 watts, meaning that even though your electricity bill won’t change significantly, you will have a light with very bright light output. Additionally to the great light emission and energy-saving abilities, this lamp is also equipped with things like multiple hanging configurations, lamp spacing that is well thought-out and guarantee that this is one of the best T5 grow lights you are going to own. You are able to hang this fixture overhead like regular lamp or horizontally or vertically by the wall, which makes the light suitable for virtually any room or garden configuration. 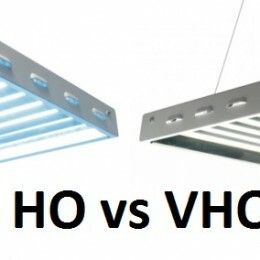 The bulbs in this fixture are spaces so that they offer best possible light coverage, so you get most out of your T5 fixture, and the fixture comes with 5 year ballast and 1 year material and workmanship guarantees, so in case anything breaks, you will be able to replace it for free if it is during those one to five years, depending on which part of the fixture breaks. The housing of this fixture is made from steel that is powder-coated, which means that the housing is not only reliable in terms of from what material it is made out of, because steel by itself if very durable and long-lasting, but the powder-coating also adds and anti-rust properties to the housing of the fixture, so you won’t have to worry about your lamp getting old even if you place it in an outdoors environment. 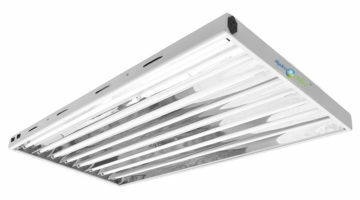 And the design of the fixture is pretty basic – the housing has a rectangular shape with the AgroBrite logo embedded on one side of it, so it is classic and will fit well into most rooms from living rooms to garages to special grow rooms. 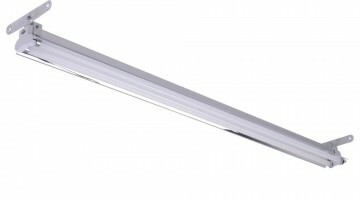 The manufacturers have used a clever solution when it comes to the reflectors for this T5 fixture. Instead of them doing the regular additional reflectors, they coated the inside of this fixture with specular aluminum, which serves as one big reflector, pointing all of the emitted light towards the plants or other objects that are under it. 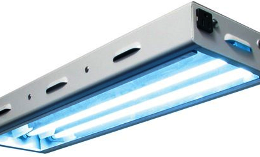 But the ballast of this fixture is a regular electronic one that will let your fixture operate smoothly and without letting any hotspots form throughout the fixture. 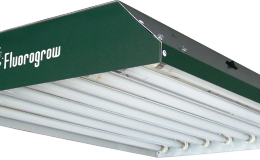 Bulbs that come with this Hydrofarm fixture are 6,400 Kelvin bulbs that is a standard for vegetating bulbs. What I mean by that is that the bulbs will emit slightly blue white light, similar to that, which we can see during a sunny summer day, so the plants will get the impression that they are growing during summer and will vegetate instead of start flowering. But you also always have the option to exchange these bulbs for 3,000 Kelvin ones, and then your fixture will promote plant blooming not growing. The total dimensions of this 2 feet 4 bulb fixture are 23 by 13.5 by 3 inches (58.42 x 34.29 x 7.62 cm), which means that it is quite compact when it comes to how much space it takes up. And the weight of it is about 11.6 pounds (5.26 kg), meaning that it won’t be overly heavy letting you move it and hang it up more easily. Is this a good light for small succulents? It is becoming winter where I live. Do I want to emulate sun to encourage it to grow, or do I want the softer bulbs to encourage them to bloom? My succulents are indoors and I have noticed them stretching bc they are not getting enough light now that it is winter. All T5 grow lights are good for succulents, if you buy the appropriate color temperature bulbs. For succulents I would suggest 5,000 to 6,500 Kelvin bulbs. 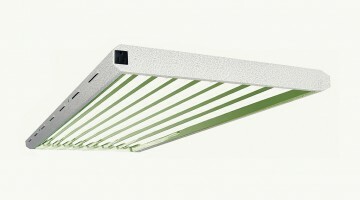 And since this Agrobrite fixture does come with 6,400 Kelvins bulbs, I think that it will be perfect for your succulents.